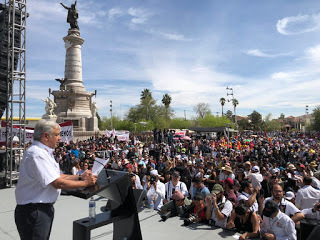 Andres Manuel Lopez Obrador at a campaign rally. Well known observer of border interactions, Kent Paterson, reports on the Mexican Presidential election and the EP Social Justice forum held last Sunday. EL PASO, TEXAS - As Mexican presidential candidate Andrés Manuel López Obrador (AMLO) continues to dominate the polls, contrary political forces are pulling out the stops to prevent the left nationalist reformer from sweeping the July 1 elections. And at this juncture, the scramble for second place in the polls is shaping up as a strategic bend in the campaign curve. That's the assessment of Rice University's Dr. Tony Payan, director of the Mexico Center at the Houston university and a longtime analyst of Mexican politics.